Walter Gropius (1883-1969, founder of the Bauhaus School and one of the principle builders of modern architecture) and Martin Wagner (1888-1957) were thinking of a new type of “town”, of a different sort of settlement for people, when they wrote this exercise instructional for their Harvard course. Housing as a townbuilding1 problem, written during the war in 1942, was intended to be an exercise (or “problem”), a case to be studied by the students in the departments of landscape architecture and the graduate school of design at Harvard. The class opened with this rare2 pamphlet as a basis for course work, given to the students on 2 Feb 1942, with the problem’s answers expected to be on Gropius desk five weeks later. Gropius and Martin put a tough, wide-ranging, landscape-changing question and expected answers in a very short period of time, though they definitely had a very structured plan and approach to dealing with massive implications of their exercise. The theory was outlined there in the paper, of course, and was expanded much more fully in class. And then there was this: a full page of datelines and expectations, a way of dealing with a large problem in logical chunks, adding up the answered bits, and then delivering a larger answer at the end and on time. I’m not an architecture or design historian, so much of this paper was a little lost on me–but I could definitely appreciate the way in which the great Gropius outlined the process of problem-thinking and solution for his students. This may be the part of this paper that I liked the most. 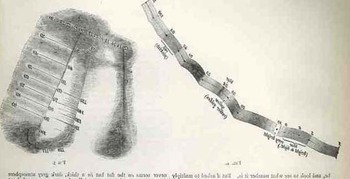 “Sounding similar themes in a 1942 joint studio problem for landscape and architecture, Walter [Gropius] wrote of the inspiration of the vernacular landscape and of integrating with existing systems: ‘Such a landscape invites the artist planner to observe and preserve its variety of aspects, and to invent a settlement pattern that .ts into its natural beauty. Fortunately our forefathers have already traced out a settlement pattern that fits very well into the landscape.’ Gropius–the grand master builder and master teacher–set out the problem and the solution”. There are of course major statements in city-building and human resettlement in this work, but for now, I’m still concentrated on the Bauhaus-founder’s outline for problem solving. 1. The full title: Housing as a townbuilding problem; a post-war housing problem for the students of the Graduate School of Design, Harvard University, February-March, 1942. And in that publication Gropius writes: “When we speak of ‘new townships’ we think of a new type of human settlement “, with a redefined vision of what a “town” means, using an idea of “reception basins” for spheres of cities as centers of culture, art and commerce “and our open country as furtherer if an industrialized agriculture and of forestry and recreation”. 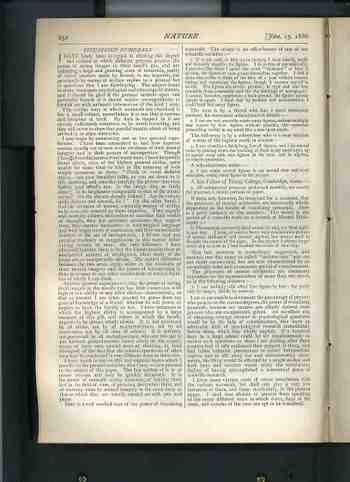 (page 21). And all of that to be manufactured along the lines of “planned super-highway systems, one branch of which is to go through New England region and will supposedly cut through the towns of Weston and Weyland”.–Gropius and Martin. 2. This copy was in the Office for Emergency Management; only six other copies have been found and these in excellent collections: MIT, Harvard Special Collections, Harvard College of Design, Cornell, Columbia and the NYPL (Special Collections). So the publication is pretty scarce, and given its method of printing and distribution, it looks like not many survived, though it is difficult to say how many were actually printed. In any event, few survived. Continuing a series of small experiments I've printed some classic panoramic images on some rather beautiful tabulating paper, taken from an 1880's ledger. All are available from our blog bookstore. Boxing scene with mamoth crowd, ca. 1910. I've experimented a little in presenting photographic images on a slightly different medium, and the results are interesting, Take for example Arthur Rothstein's classic 1936 "Father and Son" (actually, the "son" should be a plural, as there are two little kids rushing in the photo): I've used a 25 meg file and printed (lasered) rather small on a piece of antique tissue-guard paper--the paper, from 1830, is fantastically light, yet very strong for its remarkable thinness. The result of the modern, small Rothstein printed on the 170-year-old paper looks "believable" in its own odd way. 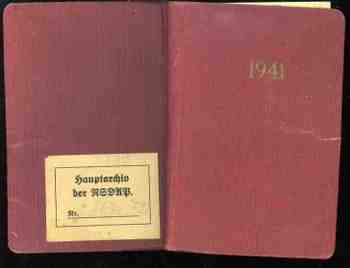 I've made some additions to an earlier post that I wrote ("Empty Memory: Telephone Number 20080 (Warsaw, Nazi Occupied Poland and the Holocaust, 1941") on this blog based on an unused soldier's diary and telephone directory for Nazi-controlled Warsaw. It is a shocking to see this thing, such a simple bit of orderliness representing such gigantic cruelty. Please follow this link to read the extended post. I posted in March 2010 a short note on a one-page letter written in 1917 by Willis R. Whitney (founder of G.E. Laboritoriesand much more) to Secretary of the Navy Josephus Daniels outlining a position for the government on the production and use of poison gas in warfare. I've added a little more biographical information to the original, and I'm also offering my original copy of the document for sale at the blog's bookstore. Enjoy. After the Air Raid, an A,B,C, of Information,by the Bute County Council, was published around 1940 (and which is available for purchase through our blog bookstore).This was printed in the town of Rothesay (by the “Rothesay Express”), which of course places publication in Scotland (though the Bute that I know is a county in North Carolina, 275 miles from where I sit–an old, 1760's-founded county, up near the border of Virginia, closing in on the coat...its not-for-nothing that they call my part of the state “the Southern Highlands”, what with the huge influx of Scots/Irish coming into this area in the 18th 19th centuries). It’s a curious publication, not the least of which is the unlikely place of its origin. The six-page pamphlet manages to cover 15 letters of the alphabet, plus a question mark at the end, for questions. Very matter-of-fact. I should think that if you needed to consult a work like this after having been bombed, that you’d want your information compact and direct. 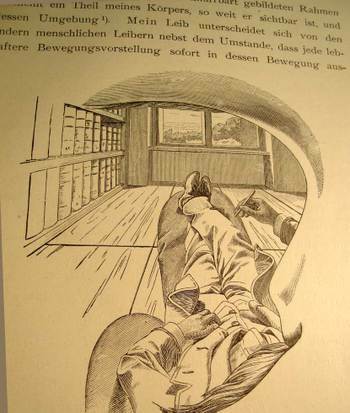 A Quick Note on an Interesting Image: is this the First Published Illustration of the Mental Imaging of an Active Thought? I asked this question in the eigth post on this blog, back in February 2008, almost a million words ago, and it seems to me that the answer to this is "yes".1 Now that I've done a bit of reading here and there, this illustration may well be among the first that tries to describe how a thought "looks" in the head of a person doing arithmetical calculation. That is to say, of how the thought-image of this process "looks" to people. "Special" people, according to Galton, who was actually writing what was also probably sciences first paper on synesthesia. I'm returning to this post now because I'm offering the original of this paper for sale., here. Enjoy. visual aids for restructuring already-completed thought patterns) with this question; l I'm not so sure that it applies. These are more issues of phylogenic memory, and concerned with memetics and semitoics rather than the actual formation of an idea. 1. 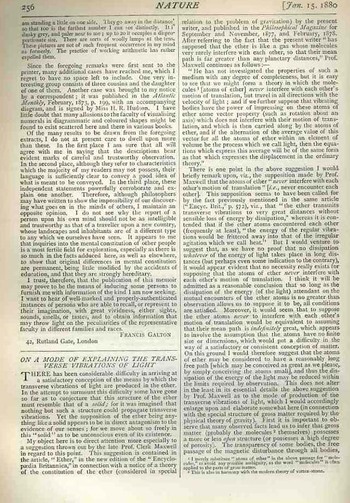 See Scientific American, May 2003, page 53, which cites the Galton Nature paper as the first of its kind. Also see Scheuren, Fritz (08/01/2003). "History corner". 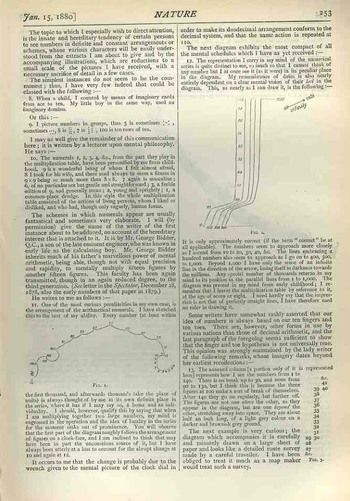 The American statistician (0003-1305), 57 (3), p. 189, which cites the SciAm article citing this. Also Ramachandran, Vilayanur S (01/01/2006). "Hearing Colors, Tasting Shapes". 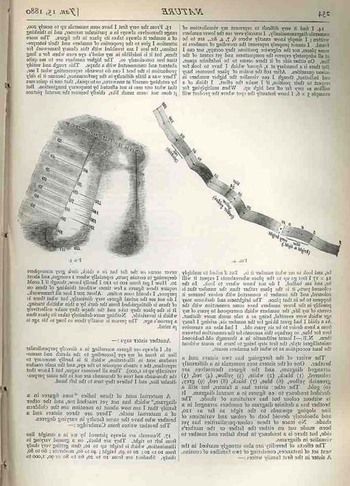 Scientific American (0036-8733), 16 (3), p. 76. And also Sacks, Oliver, (07/28/2003). 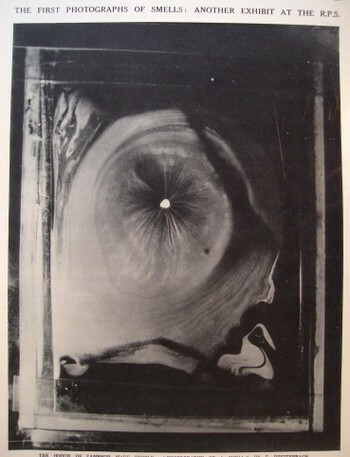 "THE MIND'S EYE A NEUROLOGIST'S NOTEBOOK". 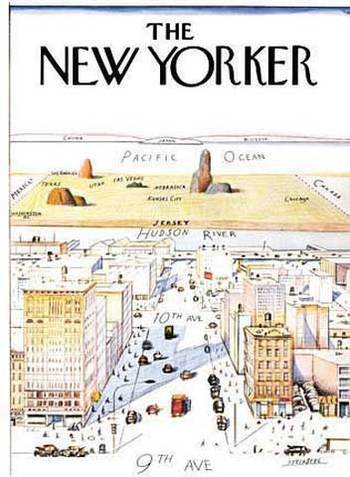 The New Yorker , 79 (20), p. 048. And lastly, Pinel, Philippe (06/01/2005). "Interactions between number and space in parietal cortex". Nature reviews. 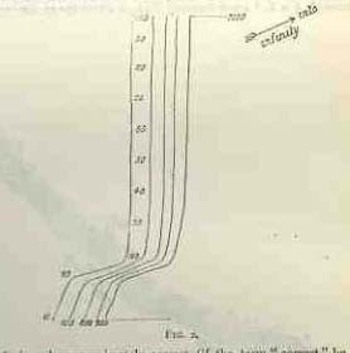 Neuroscience (1471-003X), 6 (6), p. 435.There are many others who classify the Galton paper as the "first" in its field. For a good read in general on the basic papers in the history of synesthesia, see: Synaesthesia : classic and contemporary readings edited by Simon Baron-Cohen and John E. Harrison. Oxford, Blackwell: 1997, which includes the ground-breaking Galton paper. This was not the case with the British equivalent of LIFE—the Illustrated London News. Actually, I should say that LIFE is a dumbed-down version of the ILN, which was the world’s first illustrated magazine, and which began almost 100 years before LIFE was born. The ILN covered the war like it was a war being fought in their front yards—and it was. This was also not true of one of the principle German equivalents of these two weekly photo-imags, the Illustriete Zeitung (Leipzig). There was a lot of war coverage, though much more sanitized than even the very sanitary (pre-1943) versions of reality issued by LIFE and the ILN. The Germans by and large did not use war or military images to sell common-sue, every-day consumables; it rather concentrated on the glories of battle, real and imagined, as well as using a very grandly flatulent palette to paint the image of Adolf Hitler. What caught my eye was a map in the 5 September 1940 issue of the Zeitung. (The cover woodcut illustration, by the way, is a sharpened point of the Roman standard bearer being used by the Fascist Mussolini government about to impale a running cat-thing that represented Somalia. The Italians attrociously bombed innocent civilians in Somalia and Ethiopia with abandon and disdain.) 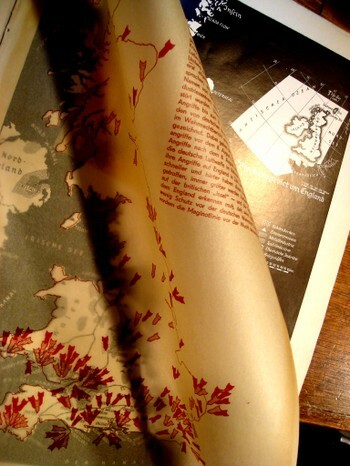 On page 165 is a two part map, the upper part being a velum-like overlay, showing the German bombardment of England. (“Bombenregen ueber England. 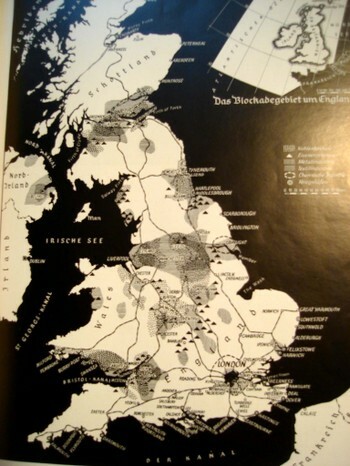 England muss jetzt allein um seine insel Kaempfen…” ) The template map is in stark black and white, showing locations of “war” industries, chemical plants, rubber works, textile plants, metal industries and gas works . 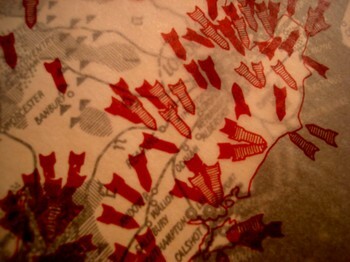 The overlay shows the outline of the island with 150 or so bombs, imprinted with a color code to show what sort of industry it was intended for. As you can see there was quite a cluster around London—I looked closely, and no one bomb was actually placed directly upon the outlined city of London. Suffice to say that no fool editor at the Zeitung was going to show their readers that German bombs were falling on a city. 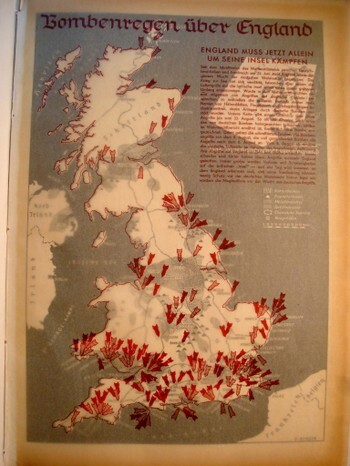 What this map shows me, outside of the propaganda aspect for its intended readers, is that the basic bits of the bombing campaign was actually true—that there was a whole crap-load of bombing going on, and going on quite well country-wide. Certainly people in England knew this but knew it in chunks. The Battle of England was being fought at this point, and the outcome was still undetermined—even though the Brits had the “ultra” and basically knew when the attacks were coming, and where. 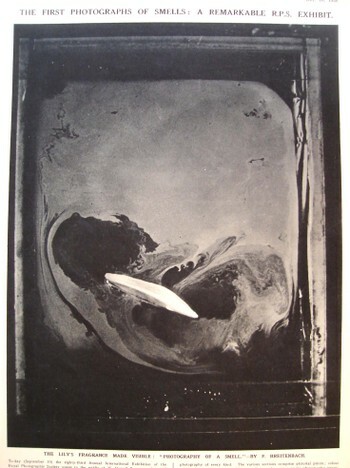 But looking at this image of the bombing from a completely different, contemporary, and ENEMYsource hammered home the fact that England was being bombed, and bombed heavily, and that its future was in real doubt. "Much of what we used for Caroline will serve for the new baby, too. Any new things I buy, I choose in neutral shades, being completely impartial as to whether it's a boy or a girl"--.Jacqueline Kennedy, on how she will dress her coming baby, November, 1960. The Kennedy presidential campaign of 1960 was certainly of a different era--it had its fair share of good and bad, but what it lacked was the noble predator of massive television coverage. There's was a minor major attempt at utilizing the new medium, and certainly from where we sit today, the effort looks quaint, naive. In the current era of micro-micro-management of micro-details, created nuance, utterly lost spontaneity, carefully crafted breathing and absolutely scripted off-the-cuff remarks, this effort seems extraordinary to the room that it left for instantaneous discussion. AUDIO (pg 1). Music: "something that establishes homey, friendly mood". AUDIO (pg 2): "guests relate own experiences as wives of political figures, then ask Mrs. K if it isn't a worry to see her husband go 17 or 18 hours, 1700 miles a day". AUDIO (pg 2): "Other possible questions: how do the Kennedys keep in touch during campaign (any interesting or unusual notes or phone messages)?". Other questions put to Jackie: --what does Senator Kennedy do on his day off? --does he have a favorite meal? --how does Mrs K spend most of her time? --how does Caroline adjust to the activity around her? --has Mrs. K had time to fix up nursery, gather baby clothes? --where does she do her shopping? Then there is this nugget (on page 4) about a possible response for Mrs. Kennedy on her impending childbirth: "Much of what we used for Caroline will serve for the new baby, too. Any new things I buy, I choose in neutral shades, being completely impartial as to whether it's a boy or a girl". VIDEO (pg 5): "suggested to close program: if there is a family picture, or a picture of Senator Kennedy in the room, someone might draw attention to what a good picture it is. Mrs. K could either bring it in closer or rise and walk over to it. Women would then continue in conversation, silent footage, while the announcer concludes the show, voice over." VIDEO (pg 6): "Drop super, camera cuts to picture of Sen. Kennedy, if possible within the Kennedy household". VIDEO (pg 6.) "Super: Vote Kennedy-Johnson the Democratic Ticket. Ending." This pamphlet holds an insight into a period, and also to one of he greatest stains of American foreign policy/humanitarianism of the last seventy years. And somehow this prolonged act is still a semi-secret, still I think not very widely known or acknowledged. Your Help for Refugee Children (March 1939) is the text for a radio broadcast by Chicago-based Dr. Charles Copeland Smith for his “The Neighborhood Guild” series. (The document is also available from our blog bookstore.) Actually, Smith gave the broadcast over to his wife (for some reason) to make this appeal-- I guess because the subject was children, and that it would best be made by a woman. Mrs. Smith made the case for the relaxation or extension of American immigration policy to accommodate the newly-minted refugees of Hitler’s Nazi Germany. The European war was just about started by the point–Czechoslovakia and Austria were already done, and Poland and the rest of the beginning of the war was just six months away. By this point, however, the war was considered a foregone conclusion by most thinking people. I have to give credit to the Smiths, as they did recognize the coming threat of Nazism, and did make the appeal for a more expansive inclusive of the relatively stingy American immigration policy. They figured that the children of refugees would be their main concern, and that accommodation should be made to accept 10,000 of them per year. That would be 10,000 “extra” children, I’m assuming, since the Smiths make the case that the current levels for allowable immigration was an at “inadequate” 27,000 per year. In 1938 there were more than 300,000 applications for U.S. visa from German Jews alone, about 20,000 of which were accepted. In 1939, a smaller number of Jews would find themselves allowed into the United States. From 1933 onwards, the case can be clearly made for the State Department, Congress and the Executive branch actively engaged in restricting immigration to the U.S. by many hundreds of thousands of European Jews. Even after it became apparent that not only were Jews being sent to concentration camps by the millions, but they were also being exterminated , that the U.S. policy for acceptance of Jewish refugees barely changed. The undercurrent of their argument for saving (“not just”) Jewish children was based on a very selective use of out-of-context statistics, concentrating on numbers of refugees coming out of Austria and Czechoslovakia, and not, somehow, out of Germany. I’m not sure how they could have gotten to their argument on refugee status for Europeans while ignoring the six years worth of anti-Jewish legal abominations perpetuated upon the German Jewish population. 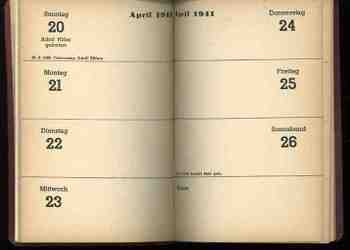 The “Law for the Restoration of the Professional Civil Service” was passed in April 1933 (the first official banishment of the Jewish people as menials, second-class citizens, banning them Jews from government jobs). The Jews had already been established by the Nazis as being the cause for the loss of WWI, the debacle at Versailles, the ruination of German culture and mortal enemy of the Aryan German. Many hundreds of laws like this would be instituted over the coming few years, establishing the legality of the supposed inferior nature of the Jewish people. (Also in July 1933 came the underpinning legislation of some future nasty thinking, Ernst Rudin’s “Law for the Prevention of Hereditarily Diseased Offspring”, which established health courts and compulsory abortion and sterilization for a variety of physical and hereditary traits found to be unacceptable for the promulgation of a superior German race.) And this is all before the Nuremberg Laws of 1935/1936, (specifically the “Reich Citizenship Law” 1936) which basically established the fate of the Jews, removing their citizenship and making them “subjects of the state”.Do I really need reiterate the case for the Nazi subjugation of the Jews, and their making the social and legal basis for the coming extermination policies which were codified at Wansee in 1942? I think not–though it seems to me that for whatever reason the Smiths decided to not utilize this already well established (even by 1939) information.I think that at the very least they did not want to know. I’d like to focus on this self-deception, the welcoming of not knowing something, of not wanting to know, of stopping: of doing nothing in the face of something needing to be done. The destruction of the Jewish people during World War II is a history with many bearings, a complex of actions that seem to have been both elusively unstoppable and eminently addressable. The psychology of why this occurred is forensically comprehensible; the ultimate question, after everything is said and done, is why the extermination was allowed to continue for years on end. There is a considerable catalog of demons of non-actions and deceits that I just can’t address now in a short post like this. Though I would like to know why was it so difficult/impossible for the British government (and in particular, Anthony Eden) to allow Palestine as a safe haven for desperate Jews, engaging in torturously long non-decisions and bureaucratic inscrutability to emergency situations? Why did Franklin Roosevelt take so long to come acknowledge the documentation of the Holocaust and then cause almost nothing to be done about it? Why did Sumner Welles act decidedly against any real action in presenting the full case of the Holocaust to American leaders? Why would the War Department (represented by Assistant Secretary McCloy) respond in 1944 that Auschwitz was both beyond the reach of tactical bombers and not be of sufficient military interest to divert Air Force resources away from other areas of interest? The knowledge of vast extermination of Jews in Europe was known by early 1943, and yet, there was little action taken to do anything to stop it. Not only that, the issue of emigration for Jews to the United States or any other country that would have them was caustic and slow; it was in short a history of the use of the word “no”. Henry Morgenthau (1891-1967), an old-line politician, was Secretary of the Treasury under Roosevelt and was also the only Jew in the cabinet. It was he who in 1944 produced one of the most compelling, and damaging, documents questioning the American government’s culpability in doing nothing concerning the Holocaust, when "officials dodged their grim responsibility, procrastinated when concrete rescue schemes were placed before them, and even suppressed information about atrocities." Report to the Secretary on the Acquiescence of this Government in the Murder of the Jews (1944). There is a certain layered, geological dystopic quality to the images of these men laboring at producing piano rolls for player pianos (and found in The Illustrated London News for 18 December 1909). This is true especially for the details, the small boxes in the background to where the rolls are being "processed"--music pounded out with metal points on a hard surface, as though produced by whatever it was that was in those little labeled wooden containers, far removed from the artistry of melody. These are images of a culture being made into hundreds of thousands of miles of hole-filled paper. The piano roles remind me of automatons replacing humans in entertainment, and then replacing the humans making the piano roles; of machines taking over the jobs of people writ large. There's a long and rich literary history of this idea, not the least (or first) of which is the appropriately-named Player Piano, Kurt Vonnegut's first novel, written in 1952. Like a tiny idea-machine, Vonnegut manufactured part of his tale from Brave New World, with Huxley having taken his bit from an earlier novel, We, written by Yevgeny Zamyatin in 1921--they're all bleak images of a future dominated by machines, the humans acquiring numbers for names, like the replaceable and expendable units they became. The devices for producing the roles remind me of Jeremy Bentham's panopticon, a functional prison designed so that all of the prisoners could be viewed from one central point. The profile of the place reminds me of the geared punch machine for the piano roles; I'm not at all sure about what the function of the prison reminds me of. But in the history of holes, I guess all it foes it fill u its empty holes with people, keeping them there for months or years or decades, and then replacing them with other people, part of a long and continuing series. 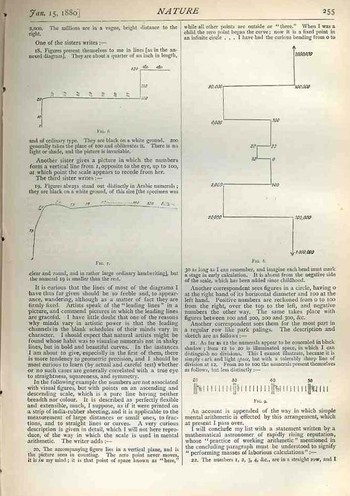 The plan and elevation of these prisons relate to the player paino paper, like the early dots and dashes of communication, like the punched cards that Vonnegut had in mind when he was writing his early classic.